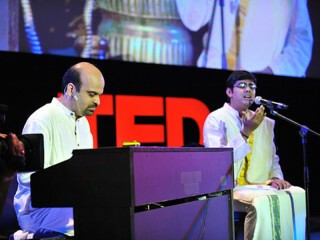 Pathbreakers in their own right, vocalist Sikkil Gurucharan and pianist Anil Srinivasan rewrote the presentation format of South Indian classical music when they first collaborated in 2006. Their work has traveled extensively since then, and they’ve released eight albums, working on their ninth. They have been TED India speakers, documented on Singapore’s national television and featured at top festivals worldwide, in addition to being national award winners in their own country. The Story of Silk is a coming together of the classical piano with the Carnatic voice, exploring concepts of mythology from across the Indian subcontinent through music and poetry across the ages.